If, we have a website or blog then when we coming to the SEO part we always want to create Backlinks. 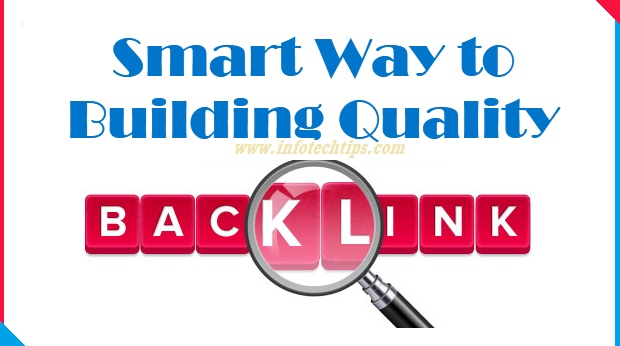 This is one of the effective way to get ranking at present if you do link building within Smart way. Many people increasing their web backlink different way. But there still have lots of mistake by taking a bad links from bad site even bad links from good sites. You might be confused about quality backlinks if you are beginners in SEO part. But I want to say that read the bellow information about Bad Link Building and Good Link Buidling. You need to know the way you have to go and the way you don't should go. ✗ Excessive link exchange (As like link to you & you'll link to them) or partner pages which exclusively for sake of the cross-linking will negatively impact of websites ranking in the search result. ✗ Links over optimized with the anchor text in the articles or press releases distributed on the other sites. Example: "There have many T-shirt on the market. If you want to Buy a New T-Shirt then you will have visit our Online T-shirt Zone. You will also need a master card to Buy T-shirt." In those sentence you can see the blue colored text are used as anchor text several time with the same link for different keywords. Its really very bad way to Build up link. ✗ Adding site to any web directory to get a backlink which can have a negative effect for your website ranking on search engine. There have lots of directories that doesn't provide the real value on the Internet users and even Google has trimmed them from search results. I think you may don't want your site to be link in there. "Thanks for the informative post. ✗ Google clearly states that for building links if you buy backlinks to improve ranking that violates their guidelines. They consider the links as votes & paying for vote its totally unethical. And potentially its being just waste of money, low quality paid links extremely on high risk. Links bought from the other sites that openly state (on their site or anywhere else) that their sold links which are your ticket for Google Penalty. ✓ As long as reciprocal link isn't done excessively & these links are on a topic. If you can link exchange within good way then its not bad at all. By posting good and unique article or sharing good information you can have that from the good site. But never try it from those site which is not have good rank and popularity. You can find it on Google search result. ✓ Its a great thing that people write about you & gives link back to your own site, but it just good as long as they create links within a natural way. Overcrowding the anchor text with the commercial keywords is far away from natural and for sure that will take you in trouble. Using the brand keywords or navigational phrases which is really a good way in this case. ✓ There still have some good directories website. From them all those best directories also provide the useful information for potential customers. New pagerank is Relevancy, So, building links in the niche directories & directories attached to the informative websites relevant for targeted industry which are beneficial for you. ✓ If you participate in on active discussion in a forum or blog that is relevant for your business and if your own comment provides the contextual value to these discussion, then you do not have to worry about sharing your relevant link. But need to make sure that you do not overdo this by using those commercial keywords in anchor texts. ✓ Instead of buying a link, you can invest time in creating high quality content, then promoting site in the way that attracts authoritative natural backlinks. Taking the way of this approach will never cost you more than buying bunch of bad backlinks and ultimately you can achieve much more better results. In this case you just need more patience to get good result. If you really want risk free approach in SEO then never ever buy the links. If you ever bought links then now just try to get rid of them. Its very important that building links that will help your website but not links that negatively can impact your web ranking in the search results. Build quality links for your business, customers, make them relevant & associate them with the great content. At these time users will be happy and Google will keep your website in the search results which will help you to grow up your business.